Dubai is a city of enchanting contrasts, giving a unique blend of the old and new. Because of the visionary leadership of Dubai’s ruling Al-Maktoum family, the city has been metamorphosed from a small fishing village into a modern dynamic city – their strategy was simple – Build and They Will Come. Whether you are a newly wed couple searching for a nice place for honeymoon, a family with kids seeking thrills and enjoyment, or just friends looking for some adventure – Dubai offers it all. And can you forget the shopping! 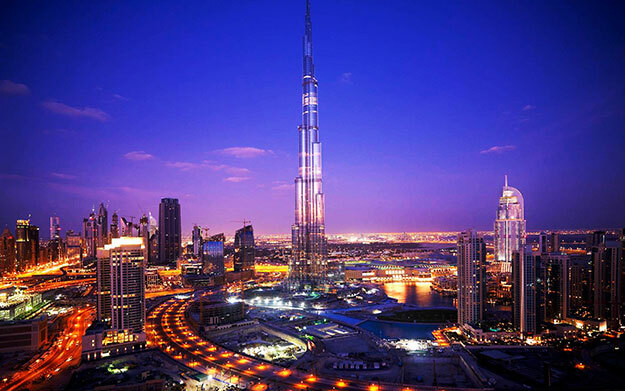 Here are some of the must-do tours and attractions in Dubai. This will take about 3 to 4 days. 1. Hop-On Hop-Off Bus Tour. This is the first tour I recommend you should do to get the layout of the city as also see the various attractions en-route. Tour the city on a open-top double-decker bus and enjoy Dubai’s sights on two different routes. You can hop-on and hop-off on the tour for unlimited circuits in your chosen time period (24-hour or 48-hour ticket). There are more than 20 locations where you can get off the bus to visit various attractions. This hop-on, hop-off tour enables you to plan your own trip or itinerary. It also includes a recorded commentary in 10 languages, which can be heard on (complimentary) headphones provided as you enjoy the tour through Dubai. The commentary narrates the history and culture of Dubai and directs your attention to important places and landmarks in the city. The lower deck of the bus is airconditioned so that the Dubai heat does not bother you. The top deck has one-third AC, one-third covered with a canopy and the last one-third is open. You will also be provided a map of the two routes. All buses have a fridge on-board where complimentary chilled, bottled water is provided for all customers. Admission to Dubai Museum. The Al-Fahidi Fort, which houses the Dubai Museum is believed to be Dubai’s oldest building. There is an underground exhibition centre where you can know about the Fort’s history. The Museum has wide ranging collection of artifacts that depict the life of Dubai’s residents of yesteryears. Admission to Sheikh Saeed Al-Maktoum’s House. This palace built in 1896, was the residence of Dubai’s ruler, Sheikh Saeed Al Maktoum, who resided here until his death in 1958. The building was created with very thick walls to keep the interior cool. It has photographs and documents showcasing the development of Dubai. Arabian Dhow Cruise. This one-hour cruise along Dubai Creek on the traditional wooden dhow offers a wonderful perspective of Dubai as you cruise along. The commentary explains the Creek’s history and points out the places of interest and landmarks before returning to the quay where you can reconnect with the bus tour. I strongly suggest you to get the 48 hours ticket, simply because the value it offers – for just about $6 (or Rs. 350) more, which is 10% of the ticket, you get full 24 hours extra and a Sharjah tour. On Day 1, I suggest taking the Red route (check if there are any changes) in the morning, which will take you through old Dubai – Dubai creek, museum, gold souk etc. While at the creek, take the free dhow cruise too and the one-way water bus (free) if time permits. 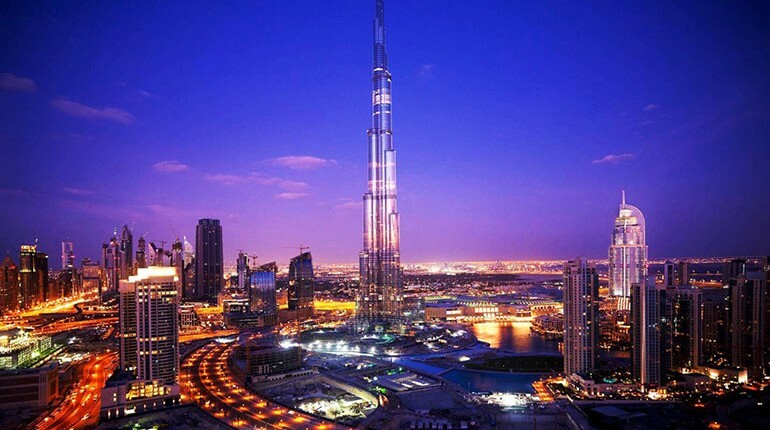 In the afternoon, take the Blue route and get down only at the stop for Dubai Mall, which also allows access to Burj Khalifa and Dubai Fountains. The Dubai Mall, part of the $ 20 Billion Downtown Dubai complex, is the world’s largest shopping mall based on total area housing more than 1,200 shops. 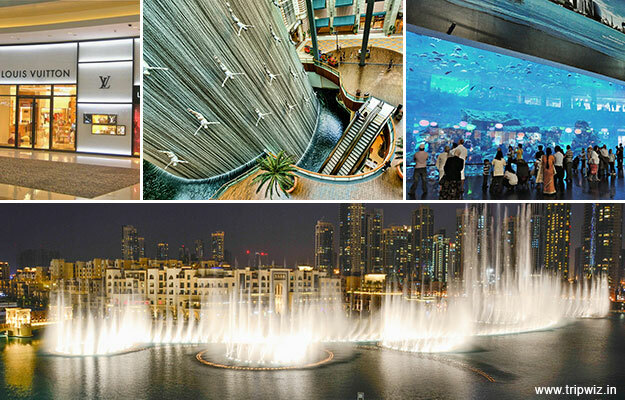 The Dubai Mall having a total internal floor area of 5.9 million square feet, includes a 250 room luxury hotel, 22 movie screens and more than 120 eateries. One of the highlights of The Dubai Mall is the Dubai Aquarium and Discovery Centre, having one of the world’s largest aquarium. Every evening, outside the mall, there is sound & light show featuring the fountains – a show which enthralls kids and grownups alike. For an excellent view, get yourself on one of the restaurants on first floor and enjoy the show while savouring the delicacies. Today, you should take the Blue route (through modern Dubai) and get down at the places in which you are interested like Burj Al Arab, Atlantis, Dubai Marina etc. You will also go through Mall of the Emirates and other malls where you can try skiing (yes!) indoor, iFly Dubai (at Mirdif City Center) having a skydiving simulator. If you visit Dubai during the shopping festival, you will get excellent deals on items like designer clothing, accessories, perfumes, eye-wear and much more. 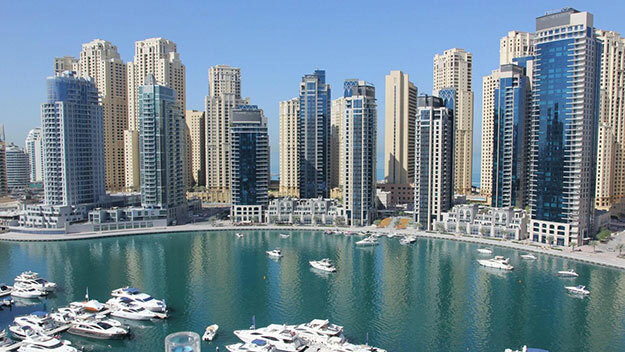 Dubai Marina is a man-made canal city, built along a 3 km stretch of Gulf shoreline. There is a large central waterway, which has been created by bringing the waters from the Persian Gulf into the canal excavated from the desert. Although much of this area is occupied by the marina water surface, it also includes almost 8 km of landscaped public walkways. The Walk at Jumeirah Beach Residence is a 1.7 km strip at the ground and plaza level of the complex and presently has over 300 shops and establishments including restaurants, cafes, shopping centers and gyms. You can get exquisite views of the Marina from this place and also spend some time shopping and eating. This tour departs in the afternoon across the desert of Dubai with several photo-stops during a heart-stopping dune drive across the desert. There is stop to watch the beautiful sunset before reaching a campsite where you have the opportunity to enjoy a camel ride or sand boarding as also try your hand on the ATV. Once inside the camp which has a village atmosphere, enjoy a delicious barbecue dinner and shisha (the famous Arabic water pipe) while watching a belly dancer performing her show around the campfire. The tour includes pick-up and drop at your place of stay, dune bashing and dinner. Other rides like camel and ATV rides are chargeable. There are 2 water parks in Dubai, one is the Wild Wadi water park and the other is Atlantis Aquaventure. The Wild Wadi Water Park, an outdoor water park in the area of Jumeirah, next to the Burj Al Arab and the Jumeirah Beach Hotel, is operated by Jumeirah International, a Dubai-based hotelier. Wild Wadi has a heated / cooled wave pool, multiple water slides and two artificial surfing machines. Atlantis Aquaventure is part of the Atlantis resort and is a water park spread across 42 acres with 7 water slides and a river ride consisting of cascades, tidal waves and rapids. There are other rides and water slides as well. You can choose any one of them, although WIld Wadi is the more popular among them. Since you pay for the whole day, you might as well enjoy the entire day at the water park! You can take a metro train up to Mall of the Emirates or First Gulf Bank Metro station and from there hail a cab. In any case, cabs in Dubai are cheap, so if you are a family, do consider a cab rather than changing modes of travel. So go ahead and have a blast at Dubai. Do let me know your experiences by commenting below. Do share this post on Facebook and Twitter, if you like it. Hi, Can you recommend which hop on hop off company ? I am planning a 4 day visit in Jan..